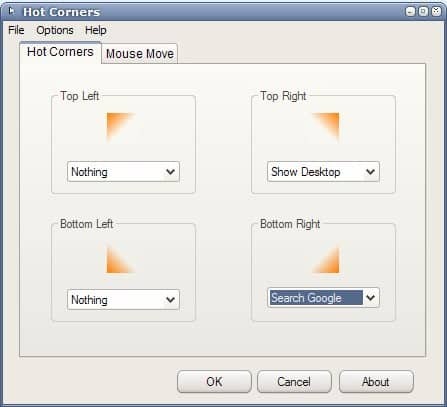 Hot Corners is a relative small Open Source application for Windows operating systems. It was written in the Auto It language which means that some virus scanners detect it as a virus although it is not. The basic application of the software program is to launch functions, programs or services by moving the mouse around. The software program provides two basic options. The first is to start services or applications by moving the mouse into one of the four corners of the computer monitor. Options like running a software program, locking the computer or handling windows. One action for every corner can be defined. It does work however best for the corners that are not occupied by the Taskbar especially if the taskbar is set to auto-hide. The second option is to add the same set of functions to mouse movements. Only this time it can be activated by pressing the [Windows X] key while moving the mouse to the left, right, up or down. The software program uses about 5 Megabytes of computer memory when running.